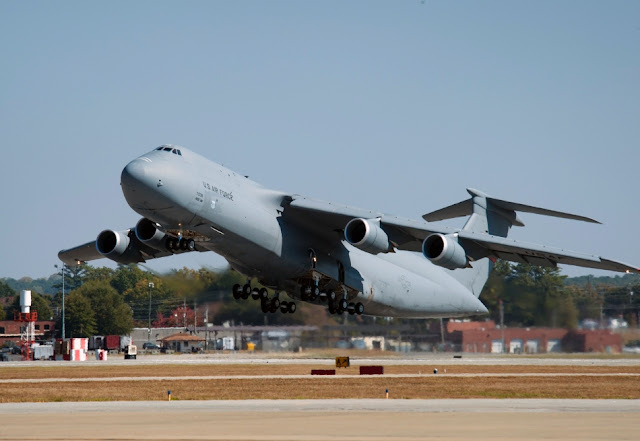 The newest C-5M Super Galaxy was ferried from the Lockheed Martin Facility on Oct. 28. It will be assigned to the 433rd Airlift Wing, the U.S. Air Force Reserve Command unit at Joint Base San Antonio-Lackland, Texas. The aircraft, formerly assigned to Westover Air Reserve Base, Massachusetts, was flown to Stewart Air National Guard Base, New York, for interior paint restoration and to receive its new Texas state flag tail flash prior to final delivery. It will be the fourth C-5M assigned to Lackland. An Air Force Reserve Command aircrew led by Brig. Gen. James J. Fontanella, the commander of the Force Generation Center (FCG) at Headquarters Air Force Reserve Command, Robins Air Force Base, Georgia, ferried the aircraft. This aircraft (U. S. Air Force serial number 87-0038, company number 124) was originally delivered to the Air Force in December 1988 as a C-5B and had recorded approximately 18,950 flight hours prior to the ferry flight. Some of those flight hours came in 2006, when Fontanella, then assigned to Travis Air Force Base, California, led a crew that flew 87-0038 around the world.